After the previous week thinking about tasseography and drawing in tea leaves, I finally felt that I was on the way to developing a body of work. As I’d spent most of the first year of my PhD reading and writing, this felt like a welcome change. I decided to leave the print work to one side for a little while and focus on thinking about the tea drawings. I’ve often been interested in these kinds of ephemeral drawings, running workshops using diverse materials such as sugar and cotton, but never really incorporated it into my practice. The message in the workshops was always related to concepts of drawing as sculpture, and later when it came to photographing the work, documentation as art. However, the same question was always asked: ‘How do we fix the work?’ Despite explaining the nature of the work and materials to groups, it seemed clear that there was an expectation of longevity. Even if the work would then be taken away and discarded, the anxiety of ‘destroying’ the finished piece was palpable. Thankfully, the projected images from photographs of the work showed them the benefits of their labour, but conceptually I was more interested in this feeling of unease. Running workshops, it is difficult to appreciate this emotion, so when drawing my own work using tea leaves, it was surprising to experience this same anxiety upon realising that I would have to destroy the thing that I’d spent time making. Documenting the work relieved this feeling somewhat, but I started to think about if and how I could present the ‘object’. These ideas were of particular interest to one of my supervisors and he directed me to look more at practices of sand painting. Such practices are widespread throughout indigenous populations, including the Navajo of the South Western United States, Tibetan Buddhist Monks and the Australian Aboriginals. Whilst each culture has its own unique customs and rituals, in every case the process of creating the art is the main goal of the work, being as each is destroyed upon completion. The art is often undertaken as part of a larger ritual which may last up to 9 days. Furthermore, each ritual drawing is created for the community with a healing or spiritual purpose in mind. For example, the Navajo ritual is based around restoring balance through prevention of disease, healing or exorcism of a particular person. One of three ceremonies is chosen by a Shaman to be performed by a Chanter. The Chanter will then select and perform the songs, dances and paintings believed to best heal the patient. When the painting is finished, the affected person stands in the middle of it and the chanter rubs their skin with the sand. Having absorbed the illness, the painting is then destroyed and the sand returned back to the earth. Other examples of sand painting include certain Aboriginal art practices which depict and share traditional cultural knowledge from a creation myth known as ‘Dreamtime’. Dreamtime is comprised of rituals which reinvent and maintain indigenous practices, which include stories, dance, songs, and sand painting, all of which explain how and why their traditions were created. However, although these rituals are part of traditions spanning hundreds of years, they are also practiced contemporaneously, and have no doubt developed in accordance with their changing infrastructures and environments. Whilst reflecting on the differing conceptions of art and its functions, these practices also suggest the possibility of introducing a more performative element to my work. Although, this still raises questions around appropriation, it does begin to contextualise these working practices within a global art context. I’ve been invited to propose a new print work for an art fair at Christie’s in London. The fair is called Multiplied and the stall is being curated by members of the London based group AM Bruno around the theme, “I’m telling you stories. Trust me”. After considering the possibility of using divination as a storytelling technique, I started to think of the work I’d been making and reading about previously. My first thought was to produce an image that was representative of a tarot style card so that I could continue to explore ideas of allegory in art and history. Unfortunately, inspiration for developing work around this idea wasn’t forthcoming, so I went back to the drawing board to reconsider how I would approach the brief. This particular drawing board was in fact covered with tea leaves, where I’d split open a tea bag and started to draw into the leaves to make an image. I’d started working with tea to create images relating to tea leaf reading (or tasseography) in order to make tea bag books. However, through playing with the material I realised that I could also produce these kinds of images in reference to divination and symbolism for the AMBruno exhibition. My previous understanding of tasseography was that the leaves were read according to the symbolic shapes that they created. However after further research, I also found that from around the beginning of the 20th Century fortune telling cups had been produced, displaying grids containing different symbols. The readings were then determined by which symbols the tea leaves congregated around in the cup. I found this interesting and decided to use a similar method in depicting my own symbols. Before deciding which symbols to use, I drew a circular grid with a pentagram in the middle creating 26 sections. This brought to mind the idea of an alphabet so I decided to create images for each of the 26 letters. I looked up the most common symbol meanings to determine a list of images and began to draw them. Although each of the images could refer to a particular meaning according to their provenance in tasseography, I hoped that any audience viewing the work wouldn’t be tempted to try to determine the ‘correct’ meaning, as for me that wasn’t the intention of the work. However, I still found it interesting to think about the selected images and their given meanings, and how they might relate to one another. For example, why would a cow symbolise money, or an apple tree foretell a journey abroad? After digitally drawing the images, I had to determine how best to produce them for exhibition. The specified dimensions for the print were 36x46cm, slightly larger than A3, so although I’d decided to make a digital print, it made me reconsider how I might print this. I settled on printing onto brown paper which I would then adhere to a good quality backing paper using a process similar to chine collé. This created an almost object-like image on the paper and gave tactility to the print. First responses to the work were good and showed a level of engagement with the image beyond the skill that it took to create it or the meaning within it, as if people instinctively felt that they could respond to it without any prior knowledge or haptic involvement.These positive reactions have made me think about how I might develop this print into a larger body of work. I’m now considering using different images or even alchemical symbols. The aesthetic of the work also suggests a game board or moving pieces. Additionally I am also considering printing back onto ceramic as with the original inspiration for the work. Learning more about the history of paper and its predecessors has led me to consider more about the ritualistic uses of these materials, in particular the uses and production of Amatl, a form of paper which has been manufactured in Mexico since pre-Hispanic times. The word Amatl derives from the Aztec language of Nahuatl, but is now more commonly known by the Spanish, Amate. This form of paper, made from the pulp of fig and mulberry bark was, and continues to be, manufactured by the Otomi Indians of San Pablito, Mexico. Despite Spanish colonisation and the introduction of the Christian religion, the Otomi continued to produce amatl paper for ritual purposes. Due to their reliance on agriculture, many of the Otomi’s religious beliefs and practices centre around spirits of the earth, rain and sun. Although these spirits had a literal relation to the growth of crops, they also functioned as metaphors to mediate ideas around kinship, culture, nature and fertility. 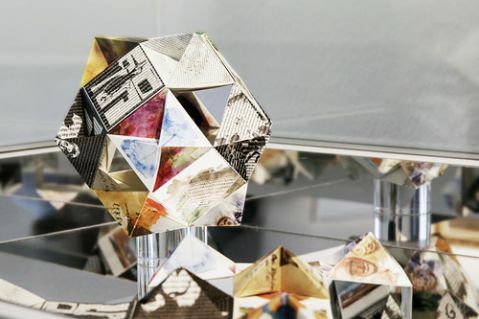 Images of these spirits are created by folding amatl paper in half and cutting out an intricate design which, when opened, creates a symmetrical figure. These figures are used by shamans within rituals in order to maintain the values and health of the community. Positive spirits, such as ‘Dios de Mazorca’ (The Spirit of Maize) is part of the series of fertility figures which ensure good crops, whereas intermediary figures, such as ‘Pajarito de Dos Cabezas’ (Little Bird with Two Heads), act as spirit messengers who watch over the Otomi and keep them safe. However, as well as the positive spirits, the Otomi also believe in a number of negative spirits, who serve to act as a warning to members of the community who go against established societal values. For example, figures such as ‘Trompa de Toro que no Respeta’ (Bull Snout that does not respect) represents the figure of a man who died for not respecting his parents, and the violence that this can cause within the kinship system, while ‘El Presidente del Infierno’ (The President of Hell) is one of a number of anti-culture figures, which are spirits that go against the values and beliefs of the Otomi. Although paper cutting has strong religious and ritual connections in Mexican tradition, it has also developed into a decorative and celebratory past time, through the introduction of Papel picado. Translated as ‘perforated paper’, papel picado is a form of cut paper decoration which is produced by stacking layers of tissue paper and chiseling a design using a transparent template which is laid on top of the paper stack. After the Spanish invasion of the Americas, they introduced their culture, language, religion, tools, and designs. Trade routes between Spanish colonies and China therefore introduced new goods into the Mexican economy, many of which were wrapped in ‘papel de China (tissue paper). The paper was often decorated with stencilled designs for ceramics or embroideries which became integrated into the papel picado designs. designs was used for various types of crafts including papel picado banners. The process of creating papel picado banners continues today and is used to make decorations for festivals such as Day of the Dead, Our Lady of Guadalupe and Christmas. Although papel picado banners are now available in more sturdier plastic, the traditional process of making paper banners begins by drawing a design, which is then placed over multiple layers of tissue paper. The artist then uses a mallet and chisels to remove sections of the paper stack, so that the image still hangs together after cutting. 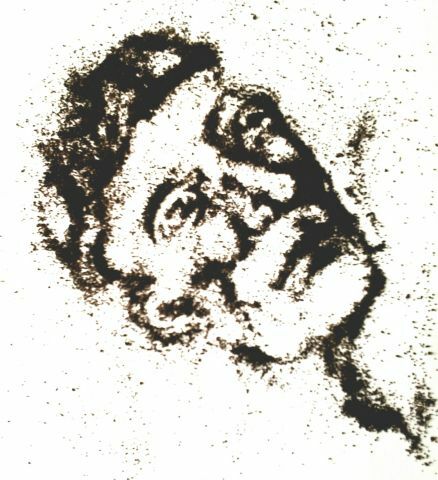 By removing the negative spaces of the image, the design is revealed, and when finished, the paper is separated to reveal individual identical sheets. This process can take around 30 hours. As we’re technically in the summer holidays at the moment, I decided to catch up on some professional development and to learn a new skill. I’d always wanted to try out laser cutting, specifically in relation to paper cutting and editioning books, and thought it might be a good way for me to explore producing more intricate book designs. I’d noticed online that Duke Studios in Leeds were running an Introduction to Laser Cutting course for the bargain price of £55 for 3 hours tuition, so I decided to find out a bit more about it to see if it would be suitable to use in my practice. We were given a quick tour around the office space, which had been built, rather ingeniously, out of laser cut cardboard. It was a nice touch to see the corrugated material walls slotted together, and it set the tone for the evening to see how far the possibilities of the production technique could go. We were given some basic information relating to the process and laser cutting including links to vector designs licensed through Creative Commons, such as the Noun Project. Our introduction to laser cutting began with an explanation of how the laser cutter actually creates the images on the material, namely by burning the design with a laser according to an vector image sent from the computer. Although this course didn’t require a prior knowledge of illustrator or another vector based programme, it would be necessary to format images in this way, if I wanted to create my own laser cuts in future. Thankfully, there are loads of tutorials on the internet in creating vector art, which would also come in handy if I ever want to upscale my printed work in future. I’m still considering how I might use this process and I think it will best come in handy for cutting a number of more intricate designs. However, trying to decide this also led me to research into the crossovers between paper cutting and ritual, as my work is currently based around what might be loosely termed paper artefacts, or fetishes. This therefore links the history of paper with the history of colonisation, creating further implications in my use of this material to create charms and fetishes.